Marc Guyon came to HK wishing to learn from the masters of Chinese martial arts. Now he gives Wing Chun lessons to Chinese students and also helms the city's association of French expats. Carrie Qiu reports. At the farthest end from the entrance next to the Fung Ying See Koon Taoist temple complex in Fan Ling, Guyon found an old man lying in the woods near the grandmaster's grave. The injured man was later revealed to be a guard posted at the cemetery who had slipped and fallen down the stairs. Wong said she and Guyon figured at that time the old man might have been lying there for more than 24 hours. His clothes seemed to have gotten soaked in the rain from the day before and dried again. The couple called an ambulance and waited until it arrived to take the old man to the hospital. "It was public holiday and probably no one had visited the cemetery in a while. We couldn't have found him if we didn't come specifically to see the tomb of Ip Man. "Somehow thanks are also due to Ip Man, because he is the reason why we visited the place," said Guyon, still quite overwhelmed at having saved a life - an act of piety which was, indirectly, the result of his being a Wing Chun practitioner and the deep respect he had for the grandmaster Ip Man. Guyon is in fact a disciple of Ip Man by extension. His first Wing Chun teacher was taught by a student of Leung Ting, supposedly the last of Ip Man's direct disciples. 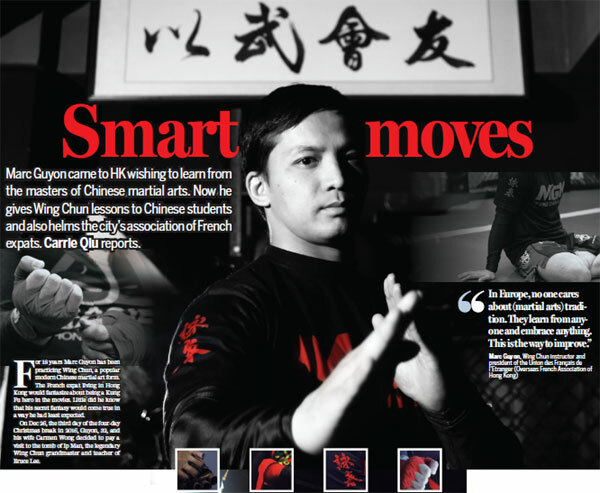 Growing up in Marseille, the second-largest city in France, Marc developed an interest in Wing Chun from watching martial arts movies made in Hong Kong. He started learning Chinese martial art skills in 1999 and became a Wing Chun instructor in 2004. Four years ago he came to Hong Kong to study Wing Chun directly from Leung Ting, hoping to get inspired and develop a sense of the historical context as to how the martial arts form evolved, only to find there was "nothing special to learn". "There are many styles of Wing Chun and I already knew Leung Ting's, so it was a bit boring." He left Leung's school, where he had eventually become an instructor, after a few months. Next, Guyon visited different schools in Hong Kong and went to weekly exchange sessions attended by seasoned Wing Chun practitioners. The group was made up of locals, mostly. Guyon soon became a star as everyone wanted to practice with him for his international style and mixed martial arts (MMA) skills. Before he came to Hong Kong, Guyon would also practice Karate, Jiu Jitsu and Savate, a boxing style with French roots. He also had formal MMA training since 2010. But Guyon's own hunger for picking up something fresh from the Wing Chun exchange sessions was far from satisfied. The Hong Kong approach to Wing Chun was too "traditional". Practitioners played it strictly by the book, following what had been handed down to them by the sifu - a term used to address a "teacher" but often used with connotations of filial reverence. And adapting techniques from other martial arts forms was out of the question. "In Europe, no one cares about tradition. They learn from anyone and embrace anything. This is the way to improve," said Guyon. He decided he would try to inject a similar spirit among Hong Kong's Wing Chun practitioners. His original plan to spend only a few months in Hong Kong thus extended to a long-term stay. He did not speak Cantonese, which was a barrier, although the South-Asian looks inherited from his Vietnamese parents might have resonated with his Hong Kong students. However, in the early days, it would be mainly his friends and a few expats showing up at the free Wing Chun classes Guyon started offering to test the market. He would use the ferry pier at North Point and the rooftop of the IFC building in Central to conduct classes. About 10 students showed up per class, maybe just two or three on a quiet day. After being a guest instructor with a studio in Central for a few months in 2014, Guyon's teaching business took off. A fellow member of the Overseas French Association of Hong Kong - an organization Guyon himself now heads - urged him to teach martial arts to a class of small children. Guyon accepted and started teaching the kids techniques from wushu, a sport based on traditional Chinese martial arts. Now two years later, Guyon is a full-time martial arts teacher and holds a number of open classes for kids as well as adults five days a week in Discovery Bay and Wan Chai. He also gives lessons in a French school once a week. The majority of his students are still expats, with a few local Chinese showing up from time to time. "Expats usually live here for two to three years and leave. A French girl trained with me for two years in high school and now she is back in France to attend university. I want more local students who stay here longer to build a long-term teacher-student relationship," said Guyon. Denis Ho, a 44-year-old IT businessman, who is one among Guyon's few Chinese students, is one such. He got in touch with Guyon after seeing an advertisement on a message board in a supermarket. At that point Ho was a complete novice. "Martial art is the kind of physical activity that keeps one's spirits up," said Ho. "The way Marc had described himself in the advert was quite interesting. He isn't someone who puts on a traditional kung fu outfit to prove that he knows the moves. His thrust was on practice and skills development." "Marc is a passionate teacher. I am really happy to see him teaching full time now," said Ho, who has been training with Guyon since he taught part-time at the studio in Central, and now attends his classes at least once a week. Last September, Guyon took on the president's role in the Union des Franais de l'tranger (Overseas French Association of Hong Kong), the city's biggest French association. The group helps people relocating from France to Hong Kong to settle in, assist them with job hunting, tax and visa consultations and direct them towards social and networking events. "We organize networking events once a month. It's pure voluntary work." Guyon said he spends at least 20 hours a week handling work for the association. "People come to the association for different reasons, but mostly for networking," said Marc. "It's a huge network." More than 12,000 French nationals are on the officially registered list of the Consulate General of France in Hong Kong and Macao. Some estimate the number of the French community in Hong Kong at 25,000. The president's post was a keenly contested one. Guyon's nearest competitor was a businessman, who wanted the position to expand his business. "So the board had to choose between either political or business influence in the association, and they chose me in the end," said Guyon, who is a member of a conservative party in France. Guyon takes his job of keeping fellow expats informed about Hong Kong customs very seriously. "I organized talks about how to pay tax, invest money and how to go about it when you want to get married," said Guyon. "Probably that's why they choose me."